Indianapolis is the quintessential Midwest American city, and it has served as a test market of Swedish-style snus by the two largest American cigarette manufacturers. In 2006 Philip Morris launched a test market for Taboka snus in Indy (in 2008 it was discontinued when Marlboro snus was launched). In 2007 Indy was one of several expansion markets for RJ Reynolds’ Camel Snus; that product went on to national distribution earlier this year. Lois Biener and Karen Bogen, from the University of Massachusetts Center for Survey Research, analyzed data from the 2006-7 Indiana Adult Tobacco Survey, and their recently published study provides some valuable information. Biener and Bogen reported that almost 20% of survey respondents throughout Indiana were aware of snus. Awareness among smokers statewide was 44%, which was 4.5 times higher than awareness among non-smokers. Awareness among respondents in central Indiana (i.e. around Indianapolis) was 29%. More importantly, about 64% of male smokers in central Indiana had heard about snus, and 20% had tried it. This is evidence that Philip Morris and Reynolds were targeting adult male smokers in their test-market campaigns, and that the manufacturers were fairly successful. Biener and Bogen also reported that risk perception played an important role in getting people to try snus. Respondents who correctly believed that smokeless tobacco is less harmful than cigarettes were almost 4 times as likely to try snus as those who had been misinformed about the differential risks. Unfortunately, this study revealed that 88% of all respondents had been misinformed, so they incorrectly believed that smokeless tobacco was just as dangerous as cigarettes. Biener and Bogen mention that information about differential risks of smokeless and smoking have appeared in the media, and they cite a 2006 article by Kevin Helliker in the Wall Street Journal. That article remains the most well researched and best written description of tobacco harm reduction, and it can be found here. The Monitoring the Future Study, based at the University of Michigan, just released its report on youth tobacco, alcohol and drug use in 2009. In October, I discussed previous findings from the MTF study. With respect to alcohol use among 12th graders, the new report is very similar to that of the previous year. A whopping 44% of 12th graders had used alcohol, and 27% had been drunk during the past 30 days. Obviously, this put them at immediate and potentially life-threatening risk for alcohol poisoning, motor vehicle and other accidents. The findings for cigarette use in 2009 were also similar to those from 2008; 20% of 12th graders had smoked in the past 30 days. In 2009, smokeless tobacco use among 12th graders increased to 8.4% from 6.5% in 2008. At first glance, that appears to be a big jump, but MTF did not find it statistically significant. In fact, MTF did not mention smokeless tobacco in its press release. Despite a paucity of evidence, anti-tobacco fanatics have already decided who is to blame. John Spangler, a tobacco prohibitionist from Wake Forest University who has a National Cancer Institute grant to study smokeless tobacco use among college students, claims that increased marketing of smokeless tobacco likely has had some effect on teenagers. Anti-tobacco fanatics have developed a brilliant strategy for dealing with ANY new research findings about tobacco use: If it’s good, take credit; if it’s bad, blame the industry. This strategy has an intuitive appeal, and it pits the public health “angels” against the tobacco industry “demons.” But it doesn’t set a very good precedent for the application of scientific principles to public health policy. And it breaks down after applying even a small dose of common sense. MTF also reported that past 30-day use of marijuana among 12th graders was higher in 2009 than use of cigarettes (20.6% vs. 20.1%). Perhaps anti-tobacco fanatics can answer this question: Which industry is responsible for marijuana use among children? Any use of drugs, most importantly alcohol, among children is a major problem that should concern every American. We need to better understand the social and behavioral reasons why children experiment and adopt substance use, and we need interventions that are tailored to the relative impact of each substance on children’s health. 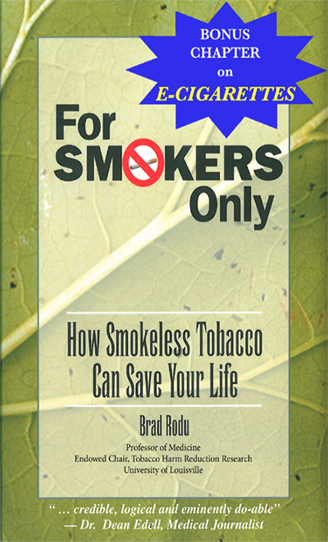 With these rational guidelines, smokeless tobacco is at the bottom of the priority list. In August, I wrote about a report by a prohibitionist University of Minnesota group claiming that one pinch of smokeless tobacco is five times more dangerous than smoking. They reported that smokeless tobacco products contain PAHs, a complex family of chemicals that are formed during the incomplete burning of almost any product, including coal, oil, gas, wood or other organic matter. Are the PAHs really toxins? Are the levels really “high”? Are emergency measures really indicated? Stepanov analyzed smokeless tobacco samples from the U.S. market for 23 PAHs, and the manuscript implies that all of these are proven cancer-causing chemicals (carcinogens). Not even close. I compared Stepanov’s list with a database maintained by the authoritative International Agency for Research on Cancer. IARC has reviewed several hundred chemicals for cancer-causation, and it has classified them on the strength of the scientific evidence as (Group 1) Carcinogenic to humans, (Group 2a) Probably carcinogenic, (Group 2b) Possibly carcinogenic, and (Group 3) Not classifiable. Groups 2a and 2b are largely based on animal or laboratory studies with no direct human evidence. IARC is a recognized authority, but it is inclined to label chemicals as human carcinogens if there is even a shred of evidence. Stepanov not only misrepresented the number of carcinogens. She implied that levels were dangerously high, stating that “moist snuff can be considered an important source of human exposure to PAHs.” Her data contains virtually no evidence for this statement. In order to discuss Stepanov’s data, I’ll have to give a short primer or review of the metric system weights. Let’s start with a reference weight 1 kilogram, which is about 2.2 pounds. Stepanov reported PAH concentrations in nanograms per gram of (dry) tobacco. A nanogram is one trillionth of a kilogram, or one billionth of a gram, so we are talking about vanishingly small amounts. A can of moist snuff contains about 30 grams of tobacco, but about 50% of this weight is water, so the effective tobacco content is 15 grams. The most important PAH on Stepanov’s list is benzo(a)pyrene (BaP), the only IARC Group 1 carcinogen. In Stepanov’s ideal world, no one would consume BaP; but we live in the real world, in which a fundamental tenet of toxicology is: the dose determines the poison. Despite Stepanov’s rhetoric, the level of BaP is very low in her tests, at an average of 56 nanograms per gram. That means that a one-can per day user is potentially exposed to 840 nanograms of BaP per day. What does this level mean? Fortunately, the federal Environmental Protection Agency (EPA) has information that provides perspective. It says that “BaP is commonly found … in cigarette smoke, in grilled and broiled foods, and … in some water sources.” According to a study published in the Journal of Agricultural and Food Chemistry, a person eating a char-broiled quarter-pound hamburger consumes about 400 nanograms of BaP. The EPA says that water can have 780 nanograms of BaP per gallon and still be acceptable. This means that someone who eats a quarter-pound burger and drinks a half-gallon of water may consume about as much BaP as a can-per-day moist snuff user. I have been very conservative in developing these estimates. First, Stepanov used special solvents to get maximal extraction of PAHs from the samples; I have assumed that smokeless users consume those amounts, which is probably a serious overestimate. It is well known that PAHs are not very soluble in water, so it is likely that actual PAH consumption by smokeless users is much lower than the level reported by Stepanov. One final comment: the EPA has estimated that on average, a person in the U.S. is exposed to about 3 milligrams of all PAHs every day. That’s 3 million nanograms. A person consuming a can of moist snuff per day is exposed to 174,000 nanograms, which is less than 6% of normal daily exposure. No tobacco product is perfectly safe, but there is very little epidemiologic evidence that using smokeless tobacco, including American moist snuff, is associated with any cancer. Despite this, Stepanov and colleagues chemically characterize these products as major causes of cancer. Their rhetoric is not sustained by their data. A new study by cancer epidemiologists clearly provides evidence that snus use among men in Sweden is responsible for the lowest cancer death rate on the European continent. Surprisingly, the authors avoid drawing this obvious conclusion in both their article and their press release. The study examined cancer mortality trends in 34 European countries over the period 1975-2004. It found that cancer deaths among men throughout Europe declined, mainly due to a drop in “lung and other tobacco-related cancers,” according to co-author Cristina Bosetti. The study shows that men in Sweden have the lowest death rates for lung cancer (less than 50% of the European Union rate) and for all cancers, while rates for Swedish women are at or above EU averages. These findings are fully consistent with my recently published study of European lung cancer, which I discussed in a recent blog post. The authors of the new study recognize that differences in cancer death rates among European countries reflect differences in smoking; they conclude that “further reduction of tobacco smoking remains the key priority for cancer control in Europe.” That’s perfectly true. But why did the authors ignore the only legitimate explanation of low cancer rates for Swedish men: the miracle of tobacco harm reduction? It is important to point out that the difference in cancer rates between Swedish men and the rest of Europe is not a new finding. The first author of the current study, Carlo La Vecchia, is a prolific epidemiologist who previously published a study of cancer in Europe during the period 1955-1989. That study clearly shows that Swedish men have always had the lowest lung cancer rates on the continent. When that study was published in 1992, there was little appreciation, either in Sweden or elsewhere, of the effect of snus use on smoking. But now there is a wealth of scientific literature on the Swedish miracle. When epidemiologists, tobacco researchers, policy experts and government regulators purposefully avoid talking about tobacco harm reduction, they put their reputations in jeopardy, to speak nothing of the lives of millions of smokers.